As Susan Herman, President of the American Civil Liberties Union (ACLU) explained, "what you hear from a lot of Americans ever since 9/11 is, 'Don't we have to give up a little liberty in order to be safe?'... as if giving up liberty is going to make us safe." This fundamental question set the tone for the Arab American Institute Foundation's panel, "Civil Rights and Civil Liberties in a Time of Suspicion" at the Democratic National Convention. 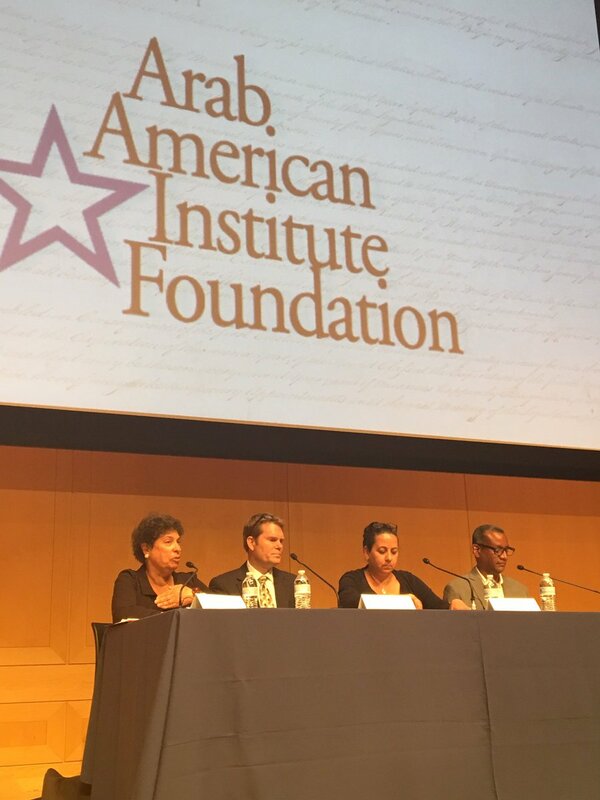 As part of an effort to bring civil rights and civil liberties issues to the forefront of national policy conversations, our panelists discussed domestic topics that disproportionately impact Arab Americans and American Muslims across the United States. Susan Herman kicked off our panel by providing an overview of the federal government’s terror watchlist and identifying the fundamental issues with this national security policy. The watchlist is a secret government list of individuals that have suspected ties to terrorist groups. Herman identified two fundamental issue with these lists. First, there is a clear lack of transparency surrounding various aspects of the watchlist(s). Second, there is no due process afforded to individuals placed on the watchlist. The guidelines for adding people to a terror watchlist are done so secretly without a trial or even probably cause. And, the redress process for individuals errantly placed on the list was found by a court to be 'constitutionally inadequate.' Although the Obama Administration has made slight improvements in improving transparency, the fundamental issues with the watchlist continue to go unaddressed. Michael German from the Brennan Center for Justice highlighted the flaws with domestic Countering Violent Extremism (CVE) programs that target American Muslims. CVE is a counterterrorism policy that at its core seeks to identify individuals who may one day use violence as a political tool. German pointed out, CVE is premised on the repeatedly disproven theory of “radicalization” and disproportionately focuses on Arab Americans and American Muslims, thereby stigmatizing entire communities as inherently suspicious. The fundamental issue with CVE is not only fails to enhance our national security, it isolates Arab Americans and American Muslims from our nation’s social fabric. To conclude our panel, Vincent Warren from the Center for Constitutional Rights discussed the criminalization of 1st Amendment practices as they pertain to the boycott, divestment and sanctions (BDS) movement. As Warren pointed out, U.S. citizens used BDS to protest against the apartheid government of South Africa in the 1980s. Contemporarily, Warren noted that some opponents of the BDS movement against Israel, particularly on college campuses, are actively violating the 1st Amendment rights of students who participate in or support BDS. To demonstrate this reality, Vincent talked about how student groups on certain college campuses have had funding withdrawn due to their association with BDS. This is a clear infringement of 1st Amendment protections pertaining to freedom of speech and expression, and the criminalization of the BDS movement stifles academic freedom. Throughout the panel, it became clear that the civil rights and civil liberties of Arab Americans and American Muslims are being violated by a multitude of national security programs that came out of the post 9/11 environment. As our panelists demonstrated, the idea that we must sacrifice some of our freedoms in the name of national security is a false notion. Violating the civil rights and civil liberties of Arab Americans and Americans Muslims does not make our nation any safer, in fact, it weakens our security and undermines the values that our nation was founded upon.